Security has always been a paramount thing for every individual. However, with advanced technology, it has now become easy to safeguard our family and business, and one such advancement is installing a biometric lock. The automatic identification based on the one’s physical behaviors and characteristics like iris and fingerprints is called as biometric authentication. We understand that when it comes to installing locks for the residential and commercial property, quality is what people look for, and we are expert in that. We have a good reputation for installing top-notch products in San Antonio to cater your door lock needs. Be it the installation of residential door locks or the commercial one; our experts are skilled in every niche. You can trust for all your door lock installations, repairs and services. Just drop us a call, and we will reach to your doorstep in just a few minutes. Further, we believe that a weak password or physical keys are the reason for most burglaries. However, by installing a highly advanced biometric lock, we make sure that our clients get a safer way to stay protected from the potential dangers. We also make sure that each product delivered from us complies the client’s needs. 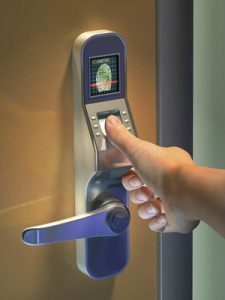 Why You Need A Biometric Lock For Residential And Commercial Needs! It offers the continence, as you become free from the hassle of keeping keys and remembering passwords. These locks are stable and enduring. The passwords are non-transferable and are less time-consuming. Fingerprints are impossible to steal, lose and broke and thus offer high extent of security and comfort as compared to other traditional locks. These locks also offer the convenience of using with another authentication mechanism to offer enhanced security. They are one of the most secure locks with no possibility of fraud. Further, with traditional lock systems that feature passwords, tokens or physical ID cards, people have to memorize or carry them along with them. However, with fingerprint locks, people don’t have to worry about misplacing making these locks the most convenience. Areas that require the physical or logical access can be easily secured using biometric locks. It’s safe, reliable and strong than any other lock. Plus, the biometrics is more reliable than the passwords combinations that are used for logging workstations and other applications. Also, some employees require different access levels as per their profile, which can be given using biometrics. Since these locks are difficult to spoof at normal areas, making it more difficult for the intruders to access any file or document that they are not authorized for. When someone is using the biometric system, only the digital representation of fingerprint or iris is stored. Users can enroll them self in the biometric system by simply capturing the image of the fingerprint. Our on-budget services are the reason why we are on the speed dial of many people in San Antonio. We provide repair and installation of biometric locks at a price that will not hamper your budget. Simply call our technicians and us will reach out to you with all their equipment. We work at flexible hours the reason we are always available. Call us and we will reach to you to assist you. We believe that our clients should get authentic and professional services on time. We also offer expert repair and maintenance services for all door locks. Our integrity, honesty and 100% customer satisfaction are what make us stand apart. We are always available for every lockout service. No one wants to put his belonging and family at risk! Reach out to us and let us help you with authentic biometric lock services. Also, if you have an emergency, feel free to call us, we will be at your doorstep in just a few minutes to help you. Biometric Locks In San Antonio, Texas https://carkeyssanantoniotx.com/lock-service/biometric-locks/ 4.0/5 based upon 25 reviews.